VIPSEAL Green has been specially designed for small vehicles that travel in green spaces like gardens, parks, forests, country trails, small town pathways, scooter and more... It enables maximum protection from all small punctures, like pins, needles, brambles, branches, nails, gravel, glass shards, etc. VIPSEAL Green reduces anxiety related to puncture-caused breakdowns, and the stress of making roadside repairs. Finally, you can drive without worry. 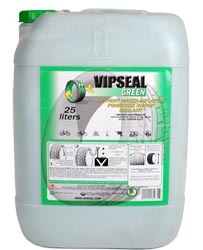 VIPSEAL Green is available in 250ml bottle, 1l bottle, and 25l drum. - Works for all types of inner-tube or tubeless tyres. - Thanks to the protective water based film that sticks to the inside of the treads, a shield protection against loss of air and punctures for the whole lifespan of the tyre. - Gives tyres 100% protection from punctures up to 4mm, by objects that don't get stuck in the treads. - Contributes to sustainable development and environmental protection with a water-soluble, non-corrosive, non-inflammable, non-toxic, fibre-free product. - VIPSEAL is a sealant for preventive punctures and is not a curative product. It stays liquid for the tyre’s entire lifespan. The product can only be used on valves with a cap that can be removed with a valve core remover. A few examples of standard volumes: bicycle or wheelchair 125 ml / tyre; self-propelled mower, wheelbarrow or golf cart 250 ml / tyre. Once VIPSEAL Green has been injected, re-inflate your tyre and rotate it for two minutes in order to distribute the product inside the treads. The puncture-proofing is then in effect. When an object is spotted, remove it, rotate the wheel a few times, and check the plugged hole. Add a little saliva to it and re-inflate the tyre if necessary.